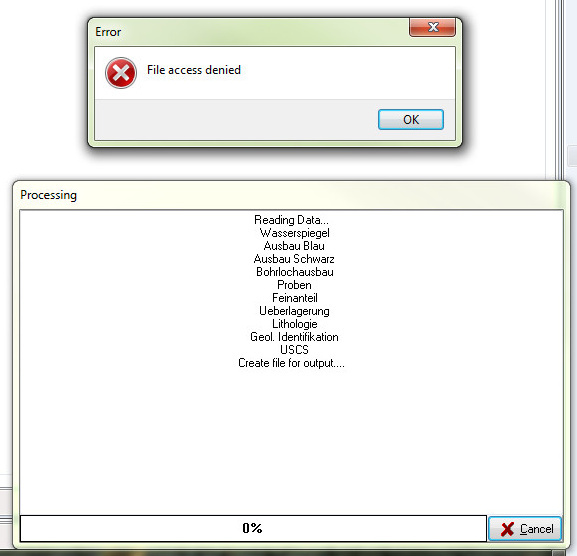 After the latest update to LogPlot V. 7.6.133.168 we get on one of our Windows 7 machines the following error message when compiling a log: "File access denied". The user has full write access to the folder C:\Users\Usrename\Documents\LogPlot 7\System where also a 0 KB temporary file is created when compiling a log. We already did a fresh installation of the local LogPlot installation and also reassigned the path to the network license file. What is the destination path for the compiled log? If it is a network drive, there may be a problem with write privileges or the network may have temporarily locked the file access. If there is a bug report generated by the error, please send the file to [email protected]. We get the same error for a local and a network destination path for the compiled log. Where would it if a bug report was generated? You would be prompted to view or save the bug report if one was created, but it looks like you are not getting a bug report. I will ask our tech support staff to take a look while I am out of the office. Does your user have the ability to compile any of the data files in the C:\Users\Username\Documents\LogPlot 7\Samples folder, such as the simple "Lithology1.dat" data file compiled into the "Lithology1.ldfx" log design? Another comment from the programmers, regarding the "create file for output..." message: "The program is only writing to memory at this point so I don't think the output file is actually the problem. It could possibly be a problem with the pattern or symbol file." Can you check the libraries that this user is set up to use, via the Options | Program Files window? Are these local, or on the network? Can the user view the pattern and/or symbol libraries via the Tools menu? Reassigning the symbol library (on a network location) did the trick. Excellent! Thanks for letting us know that this worked.